To control a heat source easily in the forming process of steel plate with heating, the electro-magnetic induction process has been used as a substitute of the flame heating process. However, only few studies have analyzed the deformation of a workpiece in the induction heating process by using a mathematical model. This is mainly due to the difficulty of modeling the heat flux from the inductor traveling on the conductive plate during the induction process. 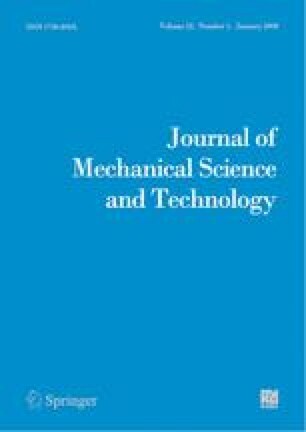 In this study, the heat flux distribution over a steel plate during the induction process is first analyzed by a numerical method with the assumption that the process is in a quasi-stationary state around the inductor and also that the heat flux itself greatly depends on the temperature of the workpiece. With the heat flux, heat flow and thermo-mechanical analyses on the plate to obtain deformations during the heating process are then performed with a commercial FEM program for 34 combinations of heating parameters. An artificial neural network is proposed to build a simplified relationship between deformations and heating parameters that can be easily utilized to predict deformations of steel plate with a wide range of heating parameters in the heating process. After its architecture is optimized, the artificial neural network is trained with the deformations obtained from the FEM analyses as outputs and the related heating parameters as inputs. The predicted outputs from the neural network are compared with those of the experiments and the numerical results. They are in good agreement. Truong-Thinh Nguyen received the B.S and M.S degrees from Ho Chi Minh city National University, Viet Nam, in 1997 and 2000, respectively. Now, he is a doctoral candidate in the Department of Mechanical Engineering at Chonnam National University, Korea. His research interests are Induction Heating, Thermal deformations, applications of Neural Network and Fuzzy logic in Industry, intelligent control. Young-Soo Yang received a B.S. degree in Mechanical Engineering from Sungkyunkwan University in 1985. He then went on to receive his M.S. and Ph.D. degrees from KAIST in 1987 and 1991, respectively. Dr. Yang is currently a Professor at the School of Mechanical Engineering at Chonnam National University in Gwangju, Korea. He research interests are in the area of weld structure. Kang-Yul Bae is a Professor of Mechatronics Engineering Department at Jinju National University in Jinju, Korea. He received a B.S. degree in Mechanical Engineering from Busan National University in 1984. He also holds the following degrees of M.S. in Production Engineering and Ph.D. in Mechanical Engineering from KAIST in 1986 and 1994, respectively. He has industrial experience from 1986 to 1998 at Hyundai Heavy Industries, Co. Ltd. as a senior researcher. His teaching and research areas include manufacturing processes, automation, and mechatronics. Sung-Nam Choi received a B.S. and a M.S. degree in Department of Mechanical Engineering from Chonnam National University in 1989 and 1991. He then complete doctor course from the same University in 2006. He is currently a Senior Researcher at Non-Destructive Evaluation Center at Korea Electric Power Research Institute in Daejon, Korea. His research interests are in the area of weld integrity, fracture mechanics, and automated ultrasonic examination.